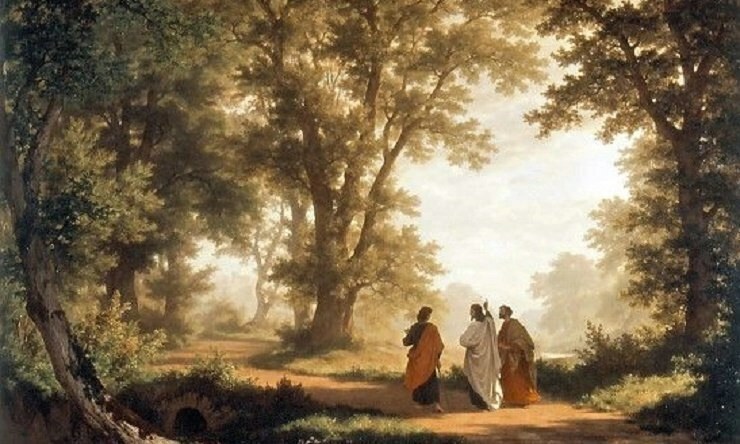 This Sunday’s Gospel (Third Sunday of Easter, Year A) tells the story about the appearance of Jesus on the road to Emmaus. This appearance is a model of our own way of meeting Jesus, for several reasons. In many of the Resurrection encounters, Jesus is meeting the main characters of the Gospel story, the superstars of salvation history: Mary Magdalene, St. Peter, St. Thomas and St. Paul. Here, as my teens would say, it’s just two random guys. They represent each of us and remind us that Jesus doesn’t just come to the superstars. He comes to us, too. No one knows where the town of Emmaus is. That information has been lost to history. But that is helpful, actually. Since this is not a story that takes place on a road a Holy Land guide can point out, it is all the easier to see this as a story of Jesus’s appearance on any and every road. Jesus meets us when we are on our way, heading to our activities, not just when we slow down to find him. 3: He meets them in their doubts. Often, we fall into the trap of thinking we have to somehow work our minds up into the perfect state of study and contemplation to be able to meet Jesus. Not so. He comes in answer to the hard questions we ask about what we see in the world, in the Church and in our lives. Yes, he often does come in answer to faith. But in our lives as in today’s Gospel, he also comes in answer to faithlessness. 4: They don’t recognize him at first. When Jesus comes into our lives, we don’t know him either, often. He may come in the guise of someone we know but haven’t taken seriously or a person we initially disregarded. He could be the woman we least suspect of being spiritual or the man whose spirituality we take for granted and tune out (often, that man is a priest). We are going along in our lives, and we notice that this person who has been accompanying us has been opening up the message Scriptures has been speaking a message just for us. 5: Once the Eucharist becomes present, he disappears. We are living in this moment in our own lives. Jesus has shown us who he is and has led us to the Church and to the altar where the Blessed Sacrament will appear. There, we have his presence, and we have access to his grace, and that is enough. While it is true that he will meet us on the roads we travel, he always wants most of all to meet us at the altar, and in the tabernacle or in the monstrance. We can always find him there.